A July Fourth celebration, just as the Founding Fathers might have done it, will take place in Morristown on the nation’s birthday. All events during this daylong salute to America are free. The celebration is organized by the Morris County Toursim Bureau and the Morristown National Historical Park. “Morris County had such an integral role in the founding our our nation. 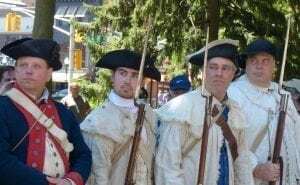 I congratulate the organizers for showcasing our history and invite all county residents to come out and enjoy a look a our nation’s founding,” said Morris County Freeholder Christine Myers. 11:30 am: March from the Ford Mansion to the Morristown Green. Costumed Revolutionary War soldiers will lead a march from Washington’s Headquarters at the Ford Mansion, 30 Washington Place, to the Green. 12 noon: Reading of the Declaration of Independence by costumed interpreters. Audience participation is encouraged. In case of rain, activities will be held in the Methodist Church of Morristown, 50 Park Place. Morristown National Historical Park is open from 9:30 a.m. to 5 p.m.
11:00 am & 2:00 pm: Hike to a NJ Revolutionary War Powder Mill. The tour starts at Acorn Hall, 68 Lafayette Ave. Revolutionary Times is generously sponsored by the Washington Association of New Jersey, Normandy Real Estate Partners, NJM Insurance Group, and Jeanne and Joe Goryeb.